Isosphaera pallida (ex Woronichin 1927) Giovannoni et al. 1995 is the type species of the genus Isosphaera. The species is of interest because it was the first heterotrophic bacterium known to be phototactic, and it occupies an isolated phylogenetic position within the Planctomycetaceae. Here we describe the features of this organism, together with the complete genome sequence and annotation. 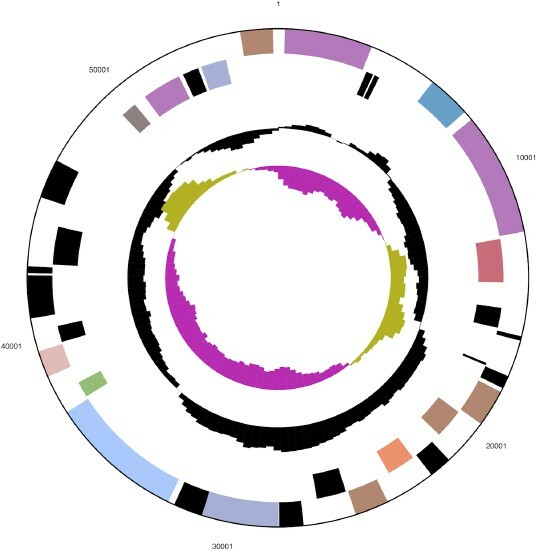 This is the first complete genome sequence of a member of the genus Isosphaera and the third of a member of the family Planctomycetaceae. The 5,472,964 bp long chromosome and the 56,340 bp long plasmid with a total of 3,763 protein-coding and 60 RNA genes are part of the Genomic Encyclopedia of Bacteria and Archaea project. Strain IS1BT (= ATCC 43644) is the type strain of Isosphaera pallida which in turn is the type and sole species of the genus Isosphaera [1–2]. The genus Isosphaera is one out of nine genera in the family Planctomycetaceae . The genus name is derived from the Greek adjective isos, equal and sphaera, a ball, globe, yielding Isosphaera, sphere of equal size . The species epithet pallida is derived from the Latin adjective pallida, pale . Strain IS1BT was isolated from a hot spring in Kah-nee-tah, Oregon, USA . Other closely related strains belonging to the species were isolated from several warm springs in North America . 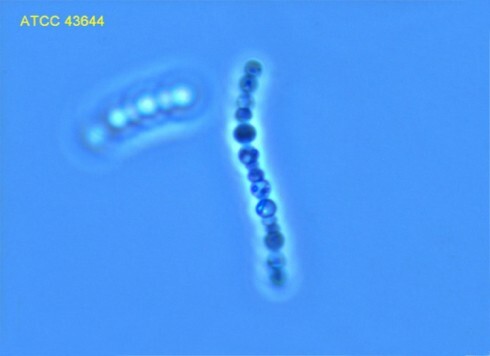 The cells resemble Isocystis pallida Worochin 1927  which was previously described as a cyanobacterium and later as a yeast. Here we present a summary classification and a set of features for I. pallida strain IS1BT, together with the description of the complete genomic sequencing and annotation. A representative genomic 16S rRNA sequence of strain IS1BT was compared using NCBI BLAST under default values (e.g., considering only the best 250 hits) with the most recent release of the Greengenes database  and the relative frequencies, weighted by BLAST scores, of taxa and keywords (reduced to their stem ) were determined. The five most frequent genera were Isosphaera (35.4%), Nostocoida (26.4%; a genus with Candidatus status ), Singulisphaera (20.4%), ‘Isophaera’ (15.9%; a misspelling of Isosphaera) and Planctomyces (1.9%). The species yielding the highest score was Candidatus Nostocoida limicola . The five most frequent keywords within the labels of environmental samples which yielded hits were ‘skin’ (3.9%), ‘soil’ (3.0%), ‘fossa’ (2.2%), ‘adult/zebrafish’ (2.2%) and ‘microbi’ (1.9%). The two most frequent keywords within the labels of environmental samples which yielded hits of a higher score than the highest scoring species were ‘adult, zebrafish’ (10.0%) and ‘conventionally-rais, digest, gender, germ-fre, gut, habitat, host, mice, micro-biota, mix, pool, recipi, reciproc, select, tract, transplant’ (5.0%), i.e. many ties occurred, rendering it difficult to ecologically interpret this outcome. Figure 1 shows the phylogenetic neighborhood of I. pallida IS1BT in a 16S rRNA based tree. The sequences of the three copies in the genome do not differ from each other, and differ by two nucleotides from the previously published 16S rRNA sequence (AJ231195). Phylogenetic tree highlighting the position of I. pallida relative to the other type strains within the class family Planctomycetacia. 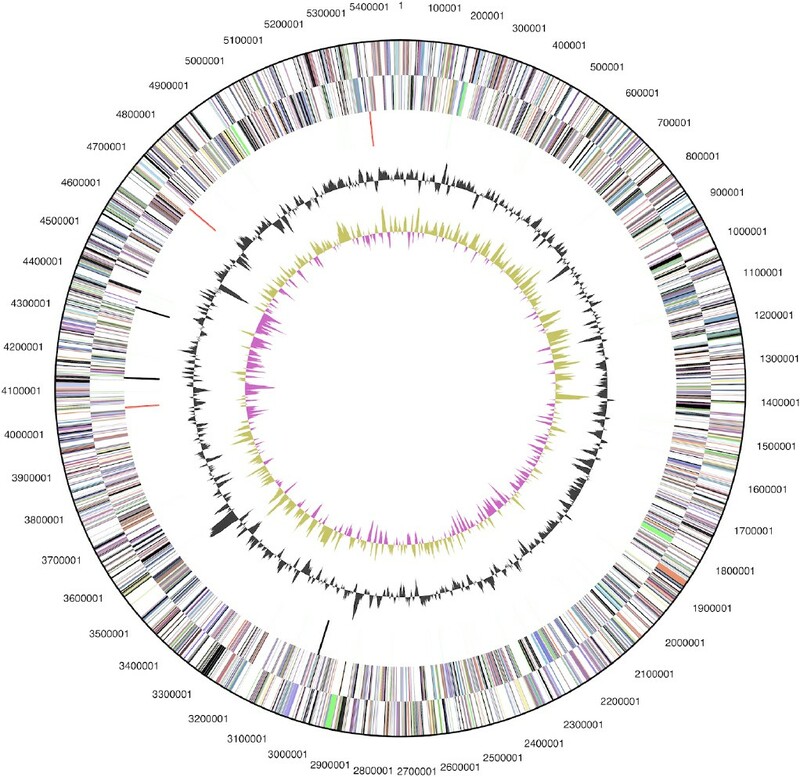 The tree was inferred from 1,362 aligned characters [9–10] of the 16S rRNA gene sequence under the maximum likelihood criterion  and rooted in with members of the class Phycisphaerae. The branches are scaled in terms of the expected number of substitutions per site. Numbers above branches are support values from 450 bootstrap replicates  if larger than 60%. Lineages with type strain genome sequencing projects registered in GOLD  are shown in blue, published genomes in bold [14–15]. Cells of strain IS1BT are spherical with 2.5 to 3 µm in diameter (Figure 2 and Table 1), with cell growth and division occurring by intercalary budding, resulting in filaments . The cells are salmon-colored (caused by carotenoids), contain gas vesicles and resemble Isocystis pallida Worochin 1927 . Ultra-thin sections observed by TEM revealed pit-like ultrastructural features in the cell wall [1–24]. The cells contain numerous pili (not visible in Figure 2) but no flagella, and form motile phototactic “comets” in liquid cultures or on media containing Gelrite® as the solidifying agent . Evidence codes - IDA: Inferred from Direct Assay (first time in publication); TAS: Traceable Author Statement (i.e., a direct report exists in the literature); NAS: Non-traceable Author Statement (i.e., not directly observed for the living, isolated sample, but based on a generally accepted property for the species, or anecdotal evidence). These evidence codes are from of the Gene Ontology project . If the evidence code is IDA, the property was observed by one of the authors or an expert mentioned in the acknowledgements. Muramic acid and diaminopimelic acid are absent from the cell wall [1–24], like in other members of the Planctomycetes. Cells stain Gram-negative but lack an outer membrane . Cells possess a proteinaceous cell wall structure without cysteine, methionine, proline and tryptophan . Ester-linked lipids with predominantly unbranched C14 and C18 fatty acids, traces of C18:1 acids, no hydroxyl-fatty acids . I. pallida IS1BT, ATCC 43644, has been in the American Type Culture Collection since July 1987. The culture used at ATCC to prepare genomic DNA (gDNA) for sequencing was only two transfers away from the original deposit. The purity of the culture was determined by growth in ATCC medium 1962 Broth  at 45oC under aerobic conditions. Cells were harvested by centrifugation after 72 hours of incubation. The cell pellet exhibited a salmon color. Genomic DNA was extracted from lysozyme-treated cells using a standard CTAB and phenol-chloroform protocol. The purity, quality and size of the bulk gDNA preparation were assessed according to DOE-JGI guidelines. Amplification and partial sequencing of the 16S rRNA gene confirmed the isolate as I. pallida. The quantity of the DNA was determined on a 1% agarose using gel mass markers of known concentration supplied by JGI. The average fragment size of the purified gDNA determined to be ∼43 kb by pulsed-field gel electrophoresis. The genome was sequenced using a combination of Illumina and 454 sequencing platforms. All general aspects of library construction and sequencing can be found at the JGI website . Pyrosequencing reads were assembled using the Newbler assembler version 2.0.00.20-PostRelease-11-05-2008-gcc-3.4.6 (Roche). The initial Newbler assembly, consisting of 36 contigs in 1 scaffold, was converted into a phrap assembly by making fake reads from the consensus , to collect the read pairs in the 454 paired end library. Illumina GAii sequencing data (461 Mb) was assembled with Velvet  and the consensus sequences were shredded into 1.5 kb overlapped fake reads and assembled together with the 454 data. The 454 draft assembly was based on 172.7 Mb of 454 draft data and all of the 454 paired end data. Newbler parameters are -consed -a 50 -l 350 -g -m -ml 20. The Phred/Phrap/Consed software package  was used for sequence assembly and quality assessment in the subsequent finishing process. After the shotgun stage, reads were assembled with parallel phrap (High Performance Software, LLC). Possible mis-assemblies were corrected with gapResolution , Dupfinisher, or sequencing cloned bridging PCR fragments with subcloning or transposon bombing (Epicentre Biotechnologies, Madison, WI) . Gaps between contigs were closed by editing in Consed, by PCR and by Bubble PCR primer walks (J.-F.Chang, unpublished). A total of 411 additional reactions and 14 shatter libraries were necessary to close gaps and to raise the quality of the finished sequence. Illumina reads were also used to correct potential base errors and increase consensus quality using a software Polisher developed at JGI . The error rate of the completed genome sequence is less than 1 in 100,000. Together, the combination of the Illumina and 454 sequencing platforms provided 140.7 × coverage of the genome. The final assembly contained 764,175 pyrosequence and 16,816,247 Illumina reads. The genome consists of a 5,472,964 bp long chromosome with a 62% GC content and a 56,340 bp plasmid with 67% GC content (Table 3 and Figures 3a and 3b). Of the 3,823 genes predicted, 3,763 were protein-coding genes, and 60 RNAs; 41 pseudogenes were identified. The majority of the protein-coding genes (59.7%) were assigned with a putative function while the remaining ones were annotated as hypothetical proteins. The distribution of genes into COGs functional categories is presented in Table 4. Graphical circular map of the plasmid (not drown to scale with chromosome). From outside to the center: Genes on forward strand (color by COG categories), Genes on reverse strand (color by COG categories), RNA genes (tRNAs green, rRNAs red, other RNAs black), GC content, GC skew. This work was performed under the auspices of the US Department of Energy Office of Science, Biological and Environmental Research Program, and by the University of California, Lawrence Berkeley National Laboratory under contract No. DE-AC02-05CH11231, Lawrence Livermore National Laboratory under Contract No. DE-AC52-07NA27344, and Los Alamos National Laboratory under contract No. DE-AC02-06NA25396, UT-Battelle, and Oak Ridge National Laboratory under contract DE-AC05-00OR22725.